A play may not leave position A and create position B if any earlier play has left position A and created position B. 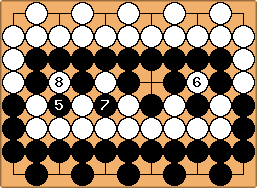 "play" refers to "board play" (as opposed to pass, which is a legal move under some rules, but not a play). 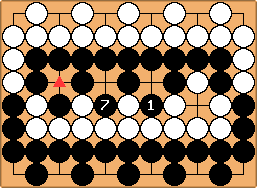 "position" refers to whole boardposition not the local position. Implicit in this definition is that this is more allowing than natural situational superko you may recreate an position as long as you make it with another play than a play that made the previous occurence. So this rule does not restrict , retaking the ko. Under situational superko (and also positional superko) would be illegal (it recreates an earlier position with the same player to move. 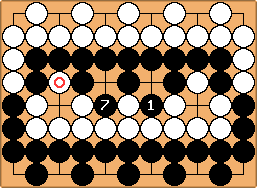 Under the fixed ko rule used alone, each open basic ko equals one eye. This changes life and death. Forced ko fights seem to be impossible under the fixed ko rule. 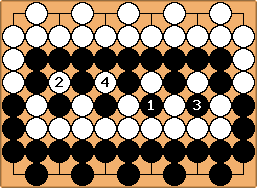 Fixed ko can serve as a research study tool if one wants to study, e.g., the middle game under simplified circumstances. Another example has been in the paper Types of Basic Ko. 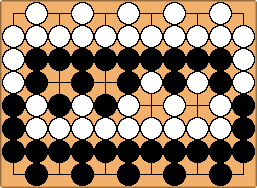 The fixed ko rule can be combined with one or several other ko rules. The practically best combination is with the basic ko rule: The Basic-Fixed-Ko-Rules. Under them, the only known ko fights are basic ko fights. Long cycle ko fights are most probably impossible. Robert Jasiek has applied the combination in several of his model rulesets or in some suggested international rulesets. Anonymous(1): Should the phrase be: A play may not leave position B to "recreate" position A if any earlier play has left position A to create position B.? RobertJasiek: Of course not. This would create an entirely different rule. Anonymous(1): The previous statement is natural situational superko, while my statement is basic ko. Never-mind, natural situational superko is inclusive of ko, so that rule holds as is. Actually, after I reread it again, the original statement is situational superko. Herman: Actually, this rule is entirely different from other ko rules. Anonymous(1): I forgot that a ko cannot be define after a ko threat has occur. It needs to be define before the ko threat. That's where my mistake lies. If we say: A play may not create position B if any earlier play has created position B. then this is effectively a positional superko right? Or is the reference implied only a single player and thus it is situational superko? Actually, I notice that understanding ko increase your strength by half a stone because you have to see ahead by one move. RobertJasiek: Anonymous, discussing superko on this page is off-topic. Fixed-ko is not superko. Herman, I could not prove yet that ko fights cannot occur but nobody has been able to construct any forced ko fight? under fixed-ko yet.